The benefits of a mobile-enabled workforce are undeniable and far-reaching. For business owners, increasing operational and business velocity is no longer tethered by time and place. The untethering benefits of mobility extend to employees, too, both in their personal productivity and in balancing their personal and work lives. For IT, however, equitably facilitating workforce mobility across all of an organization’s factions with each faction defining workforce mobility in its own terms is, to say the least, challenging. Too often IT is forced to make compromises. And with these compromises, one or more of the factions will be unsatisfied, potentially to the level that their dissatisfaction materializes in negative consequences elsewhere. Unfortunately, what was once considered an equitable compromise turns out to be a barrier in capturing the full benefits of workforce mobility. Ultimately, technology can minimize compromises such that more or even all of the factions consider themselves winners. 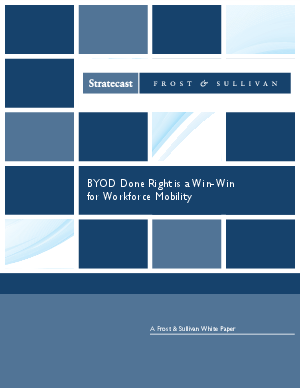 In this paper, we discuss why a bring-your-own-device (BYOD) approach to workforce mobility can be a compromise-free approach, and then how the combined capabilities of Samsung KNOX and Enterprise Mobility Management from AirWatch by VMware® turn this compromise-free approach into reality.